Pah, I’m not buying any more of it. That’s interesting, but it should be excellent fairly new too, IMO. How is the hopping on this one I wonder. If a similar beer was 8-9 lbs hops per barrel in the 1800’s and this one is 1 lb, say, maybe that would explain the lassitude of reaction. Of course I don’t know how much hops were used. Seven quid? For 50cl @10.7%? That’s not a bad price at all. What’s wrong with people? Our particular complaint was that it was £7 for 500ml of 10.7% beer that gave us no more pleasure than many c.5% dark beers (e.g. 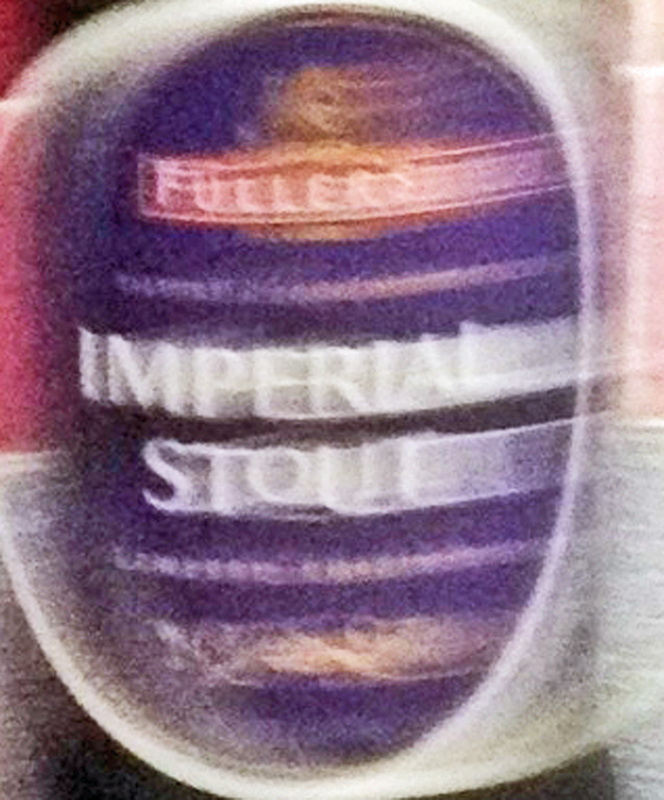 Fuller’s own London Porter) available at a third of the price. (DISCLAIMER: haven’t checked prices or done sums so please don’t tell me off if FLP is actually only half the price.) We liked FIP, but it wasn’t anything like the instant classic we were expecting. It didn’t help that, at around the same time, people were buying Courage Russian Imperial in Tesco for a couple of quid a bottle. But, fanpeople that we are, we bought a case too, and have quite a few bottles left. Might have one tonight, in fact. A couple of quid… locally the Courage Russian Stout went for £1.00 / bottle. I stocked the cupboard. I will buy a couple of bottles of the Imperial Stout & put it away for the autumn. It’s worth a try. You guys are killing me. Courage is going for approximately $6.50 here. It was £8.50 when I got it from the brewery shop. Well, seven quid is approximately four quid more than I’ve ever paid for a 500 ml bottle of beer, so I think a certain amount of reluctance is understandable. Secondly, I didn’t ask for 500 mls of a beer this strong & would have been perfectly happy with a 330 ml bottle or even an old-style ‘nip’, which would presumably have made the price a bit less ouchy. Thirdly, you can’t actually pay £7 for this; you either pay £7.95 for delivery (making the crate price £7.50 per bottle & the single-bottle price £14.95) or you rock up at the brewery shop like Ed & pay £8.50. You make a great point on bottle size. I always prefer a 33cl or a ‘nip’ when it comes to imperials or barley wines. They’re much more civilised! I must also say that my past experience of many imperial stouts is that they really are worth the wait if you can age them a year or two, especially the 9 or 10% + ones. My aged Driftwood Singularity Imperial Stout comparison evening of new vs aged showed the two year old bottle beating the recent vintage hands down! I have a barrel aged North Coast Old Rasputin that I’ve kept for 5 years, I will blog about that when it gets opened! Flavour, complexity, integration and balance are the rewards for the patient drinker! Ray or Martyn, pour a couple of ounces (max) from any American-style IPA in a bottle of this. This will emulate many mid-1800’s strong porters since American hops were used as you know in a supporting role, often When just a little is used the overall effect ifs superb. A little goes a long way, perhaps start with an ounce. I have a bottle that Derek gave us on our last visit. Cannot wait to try it, but I’ll give it some time. I’m torn. If I was going to buy this, I’d want to buy a case, but £78 for twelve bottles is a lot. (Not as much as £22 for two or £15 for one, of course.) And why haven’t they used a smaller bottle for such a strong beer? OTOH, the Past Masters Double Stout was one of the best bottled beers I’ve ever tasted, never mind bottled stouts, so I don’t doubt it’s good. Interesting to see the price response here. It makes me think that either you have yet to experience the joys of wine-priced specialty beers, or we Americans are chumps and rubes. Either way, £7 would induce no sticker shock for an American. We’ve also gotten pretty used to the concept of aging our stouts, as well. I wonder if this post will look quaint to readers in another five years? It does speak a bit to the cult of “furniture polish fresh overly hopped bombs” or the “cult of the brewers palate.” Ready to drink beer doesn’t need to be like ready to drink wine but it certainly isn’t superior. Drinking Fuller’s Vintage under 5 years old is a waste. I thought the real story here was a rather revolutionary addition of rose buds to the recipe. I enjoyed it and suspect it will age magnificently. As for price it looks like the UK is finally catching up to what we pay for beer. You’re making it sound like that’s a good thing………. Not really but the wailing does make me smile. On the whole your beer is still very cheap. I think it’s actually that *your* beer is very expensive, following very deliberate campaigns by some craft breweries in the US to jack prices up. Beer should be affordable, it’s not expensive to produce. The snobbery and elitism that underlies beer being priced like fine wine is contrary to traditional beer culture, in Europe at least. But, hey – it’s your money……. Rod, you’re right, but that doesn’t excuse the smugness and condescension. Hmmm, it’s £7.75 on the notoriously inaccurate price list of my local specialist beer seller that’s £1 more than they’re asking for 2013 Vintage ale. This makes the £4 the dodgy local offie that specialises in ‘chronologically challenged’ beer is asking for the 2010 Vintage look pretty good, though I’d wonder where and how it’s been stored. I wonder if the bottle of Thomas Hardy I bought in ’86 is actually drinkable? If you’re worried, send it to me and I’ll test it for you …actually, the answer, in my experience, is almost certainly “yes”. Having had a fresh one a few months ago, and having thought it was quite nice, but perhaps in need of a little age, this article piqued my curiosity. And so four bottles arrived today. I’m tasting one now and it’s a greatly improved beer for sure. Looking forward to seeing how the others develop, perhaps six months apart. Six months on and I’m having another bottle and it’s terrific: the excessive sweetness is totally gone, it’s rich and deep and dry, lashings of licorise and dark chocolate. 13 months on from that and it’s still going strong. Full and smooth, and all the flavours are so subtle. The rose in the background is almost savoury. It’s really delicious. I’m glad I still have one left.